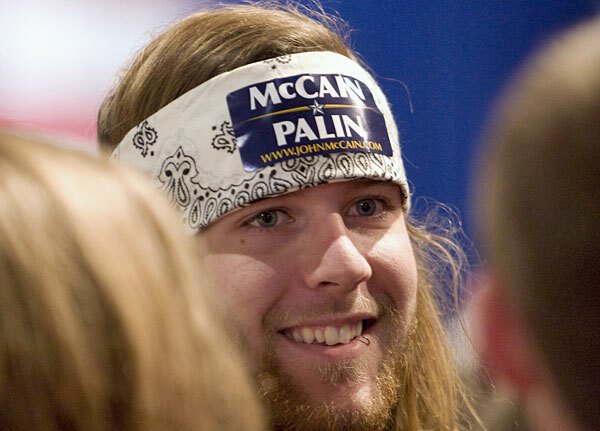 I can pretty much guarantee that this man photographed at a Romney rally in Lancaster, Ohio, is not in fact a Republican, but rather is a plant sent out by the Democrats as a dirty trick. 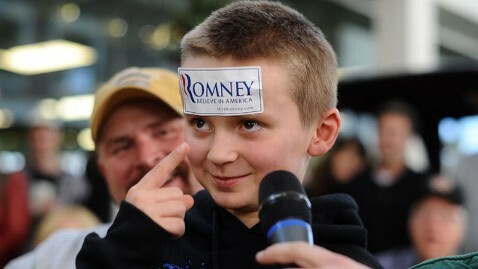 Clue #1: Wearing a “Romney/Ryan” sticker on the back of his T-shirt. Nobody does this. Nobody. Clue #2: It’s kind of chilly in Ohio this time of year, and the guy’s wearing only a T-shirt, while those around him are wearing coats. My guess is that this guy also wore a coat when he entered the rally, then stationed himself toward the back of the crowd (in front of the riser where the press photographers are stationed) and then removed his coat to expose the T-shirt, with the explicit purpose of having it photographed.
. . . aaanndd, Clue #3: No name? A press photographer is going to take a picture like this and make no effort to ID the guy? Nuh-uh. Speaking of which: I decided to go over to the American Spectator blog last night and write a lengthy explanation of exactly why the vicious creep James Pogue can go straight to hell. Finally: We had an unfortunate incident in which a commenter got smacked by Wombat’s Troll Hammer for some things the commenter was saying about Mormonism. This was an unfortunate incident, I say, because the commenter was in fact a tip-jar hitter, who generously contributed to the Shoe Leather Fund to support last month’s Ohio trip. And so I’ve urged Wombat to restore the commenter’s privileges, after making a polite explanation of the problem. This is as good a place as any, perhaps, to reiterate the policy: I have neither the time nor interest to monitor comments for off-topic or offensive content. Thus, Wombat is the designated Troll-Smasher, and the policy is whatever Wombat says it is. So if you’re in the comments having an argument and Wombat says to knock it off, please comply. We are at the GAME FACES stage of the campaign, folks. Election Day is barely three weeks away, and we can expect the Leftists to be out in force with all sorts of false-flag/concern-troll antics, so Wombat is apt to on hair-trigger alert, ready to smash the hell out of anything that looks even vaguely trollish. Ergo, Wombat’s warnings should be taken quite seriously, lest we have any further unfortunate incidents. Also, at some point this upcoming week, my plan is to go off on a long campaign-trail trip that might go all the way to Election Day, so now would be a good time to contribute to the Shoe Leather Fund, as it usually takes three or four business days for the cash to get from the tip jar to my bank account. Thanks for your patience and generosity. Polls are quite encouraging for Romney (Nate Silver continues his slo-mo walkback with the Forecasting Model) which means that the end of our Long National Nightmare may now be within sight. Once we get to Nov. 7, we can go back to snarking at celebrity meltdowns and all the other fun stuff that makes America great. But meantime . . .
Vice President Joe Biden took Americans on a one-way trip to Malarkey-ville [Thursday] night, with a weirdly aggressive debate performance in which, according to one count, he interrupted his Republican rival 86 times. Even many of those who generally approved of what Democrat spinners referred to as Biden’s “happy warrior” act expressed concern that the vice president was, to quote CNN’s Gloria Borger, “condescending at times” toward Wisconsin Rep. Paul Ryan. Make that “condescending at all times,” and you may have a consensus that would include even the debate’s liberal moderator, Martha Raddatz of ABC News. Biden’s behavior resembled the hypomanic phase of bipolar disorder, as he grinned incongruously or faked laughter in reaction to Ryan’s answers, rudely scoffed at the Republican’s policy proposals as “bluster” and “loose talk,” and bulldozed past whatever feeble attempts Raddatz made to halt his repeated filibusters. Arrogant? Overbearing? Angry? If those are your ideal qualities in a vice president, Biden’s your man. . . . Whenever the Dems are in trouble, they start this sort of thing. They’re in trouble now. Expect the bylined Democratic operatives formerly known as journalists to help as much as they can. Condescension & sneering, laced with sputtering laughter, is not the trait of a political leader(sic) that I want just a heartbeat away from the presidency. At least Ryan takes all he does seriously. Your Point #1 is an excellent observation. In all of recorded history, no one has ever worn a bumper sticker on their clothing, particularly not at a political event. Excellent catch– and good for the pudgy middle-aged man in the video for losing all that weight, shaving his head, and apparently getting a narrower skull before he went to this Romney event.